Glass block windows are composed of a number of single, modular glass blocks set with mortar in the opening of a wood or masonry wall. Sometimes an individual glass block cracks, gets scratched or breaks. If just one glass block in a window grouping is damaged, it affects the look of the entire window. 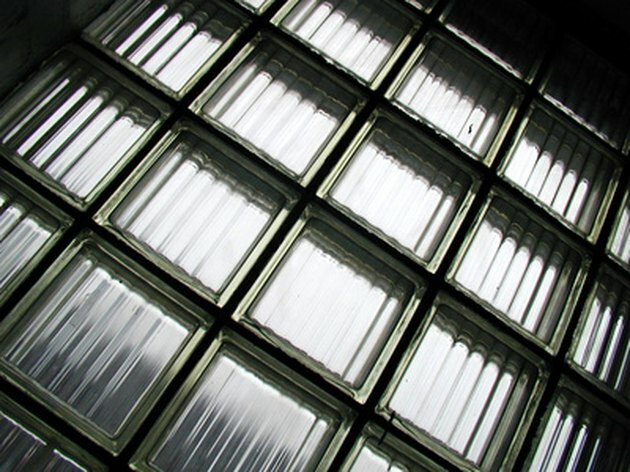 Individual glass blocks can be removed and replaced without taking apart the entire window. Cut strips of furnace duct tape and place them over both faces of the glass block you will be replacing. Put on safety glasses, work gloves and a long-sleeved shirt. Strike one face of the glass block using a rubber mallet until the glass breaks. Most of the glass should stay stuck to the duct tape. Repeat on the remaining face of the glass block. Place duct tape and any glass shards in a bucket. Vacuum to remove any shards and slivers of glass. Chip out the mortar surrounding the damaged glass block using a chisel and hammer. Be careful not to chip or crack any of the glass blocks adjoining the one just removed. Mix up some pre-mixed mortar with water to the consistency of bread dough. Using a trowel, place a layer of mortar on the bottom surface the new glass block will be resting on. Match the thickness of the mortar to the existing mortar joints created when the original glass blocks were installed. Slide the new glass block into the opening and center it. Start packing mortar into the spaces on the three remaining sides of the block. Do this from the inside of the building and the outside. Pack the joints until they are completely filled. Wait for the mortar to get firm, about two hours, before taking a striking tool--a narrow, spatula-like tool used to smooth and compress the mortar joints. The striking tool gives the mortar joint a clean, professional look. Wipe the glass block clean of any mortar with a soft, damp cloth.